Landmine detection as part of humanitarian demining operations requires extremely high detection rates. In a humanitarian demining operation, one cannot allow that any personnel gets injured by exploding mines. Therefore, the detection performance must be extremely high. This was pursued by combining state-of-the-art sensors and the application of sensor fusion in the framework of the Dutch government humanitarian demining project ‘HOM-2000‘. Different sensor fusion techniques were applied to achieve improved detection results such as thermal and ground radar sensors to build up a three-dimensional image of the subsoil. Around 1997, an outdoor test facility was realised at Waalsdorp to test, improve and develop landmine detection equipment. This sophisticated facility allowed us to access and compare the performance of the individual and combined sensors (sensor fusion) against a variety of threats. The test facility had six strips of 30 square metres land, each filled with a different type of soil. The groundwater level of the strips could be regulated separately and the temperature of the soil and of the test mines was monitored. A moveable measurement platform was realised in a way that it was completely free of electrically conducting materials. With this platform, the individual or fused detection systems could be moved automatically over the whole test site with an accuracy of one centimetre in every direction. The dimensions of the test strips are 10 m x 3 m x 1.5 m (length, width, depth), with a distance of one meter between them. In order to determine the dimensions, the following considerations were taken into account. The minimal width of the strips was based on a vehicle-mounted landmine detection system with a maximal width of one metre. Based on this width and to avoid edge effects, the width of three metres was chosen. The depth of 1.5 metres was chosen to keep the soil profile as natural as possible. Disturbing radar reflections from the bottom of the strips were expected to be minimal at this depth. To put as many different mines in the strips as possible and to be able to measure with a forward-looking infrared system, the strip length of 10 metres was chosen. The distance of one metre between the strips was sufficient to prevent the disturbance of objects situated in the adjacent lanes. To avoid distortion of metal detector measurements, the strips were constructed of wood without the use of electrical conducting engineering materials. Around the six strips. a zone of five metres wide and 1.5 metres deep was freed of any metals. Landmines can be found in different soil types like clay, sand, stones, rock etc. Preferably native soils from countries with a large mine threat should have been selected for the test facility. However, due to environmental regulations in the Netherlands only Dutch native soils were allowed to be used. A selected set of soils were chosen that covers a wide range of different soils. The test strips were filled with the following soil types: sandy soil, clay, peat, ferruginous soil, a sandy woodland soil (partly with roots and partly without roots), and a strip with a grass vegetation covered sandy soil. For the first five types of soil, a chemical and physical description was available which gave the insight of the texture and the structure. While filling the strips, the natural layer structure of the soil was preserved at best as possible. An important parameter was the soil moisture content because it affects electromagnetic and thermal soil properties of the soil, and thus (possibly) the detection performance of mine detection systems. 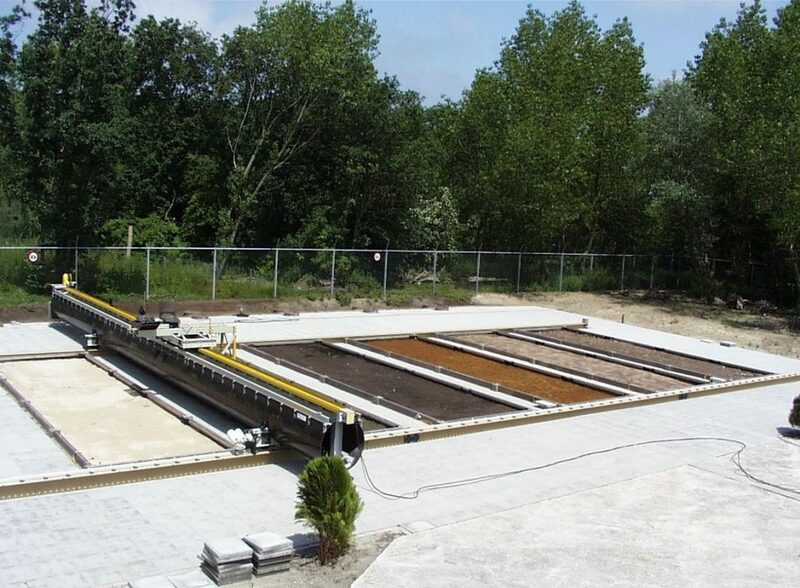 In this test facility, it is possible to regulate the soil moisture content of the top layer by controlling the groundwater level. For this reason, the inside of every strip was covered with plastic sheets to separate the groundwater in the strip from the groundwater outside the strip. At the bottom of the strip, a drainage tube was placed which was connected to a reservoir. The water level in the reservoirs, which were situated outside the five-metre metal-free zone, was controlled automatically. A measurement platform was developed which can carry individual sensors (Thermal infrared spectroscopy (TIR), metal detector (MD) and ground penetrating radar (GPR)), as well as a combination of sensors. Just like the test paths, the measurement platform was constructed with non-electric conducting materials. The platform comprises a 17-metre long glass fibre enforced polyester tube with a diameter of 0.9 metres. On top of this tube, rails are constructed which are aligned to be flat within 5 millimetres over the full 17 metres. A sensor platform which could carry a total payload of 600 kg moved automatically over these rails. The electric motor for this movement was positioned outside the five-metre metals-free zone. The height of the sensors could be altered from 0 centimetres to two metres. The viewing angle of the sensors could be altered to view the surface from different perspectives (angles). The polyester tube was manually moved from path to path over rails (see photo). In this direction, the position of the platform could be changed in steps of 5 cm. The accuracy of the platform was 1 cm in all directions. The position of the sensor platform along the tube was measured continuously with a laser distance meter and was logged versus time. This measurement had an accuracy of 2.5 mm and a duration of 50 ms. These position values were used to analyse detection data afterwards. The position of the measurement platform relative to the strips is shown below.